Pretty awesome weekend out there.. Went Heli skiing for the second weekend in a row (ouch, I’m done now). Next weekend I’m heading off to Web Directions North 08 (last year was awesome), so I’ll be heading out to Whistler with that group.. Should be a good time, so if you’re in those neck of the woods drop me a line. I was there last season.The weather was awful, rain, cloud and no snow in Whistler Resort. I thought it was going to be a waste of money with not much powder but I was so wrong. They know the best places to go and Powder Mountain is a completely different scenario to Whistler Village. He found us untouched powder – we were knee deep! 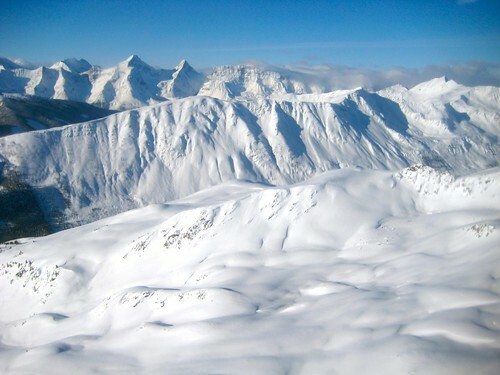 And the weather brightened up too.I really recommend Heliskiing Whistler– don’t let the weather or cost put you off!